from the BBC program Front Row, October 31, 2008. ^ 1.0 1.1 1.2 1.3 1.4 1.5 1.6 American Centaur: An Interview with John Updike. The New Yorker. ^ John Updike. Front Row. October 31, 2008 [January 18, 2014]. BBC Radio 4. 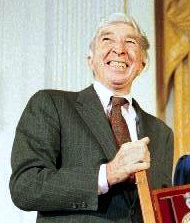 LION author page for John Updike, includes full bibliography, biography, references, and access to more than 1000 pieces of Updike criticism. "John Updike 1932–2009": A collection of pieces on the writer and his TLS critics over the past fifty years, including two pieces by Updike, from TLS, January 29 2009. He took the novel onto another plane of intimacy, Martin Amis, The Guardian, 28 January 2009. John Updike 1932-2009, Eric Homberger, The Guardian, Tuesday 27 January 2009. A Life in Pictures (15 pictures), The Guardian, January 2009.